Parental Tech: Is a longer school year really the answer? Is a longer school year really the answer? Who needs a summer vacation when there are things to learn and tests to ace? If Obama has his way the summer vacation and after school hang outs will soon go the way of buggy whips and 8 track tapes. But I have to wonder if it isn't quality over quantity that really counts. My selective perception must be selecting only things that show that methodology (one-on-few) and the ability to adapt the teaching style to the individual pupil has more impact than the amount of time held hostage in a classroom. The article on Yahoo! News yesterday does provide some general references that might lead you to support this premise. For example they cite that spending more time in school studying math does increase math scores but by how much. And is it as significant as the increases seen by using online education delivering custom tailored classes that are student paced? Or how does this compare to homeschooling, that shows a 30+% increase in test scores? And what about the case for waiting longer to start school? Singapore holds the distinction of having the highest math scores worldwide and this country waits until children are 7 years old before starting school. I'm not against spending more time in studies, I just think we need to be absolutely sure that we are investing that time in the best and most productive learning environment rather than creating a holding cell for our kids. 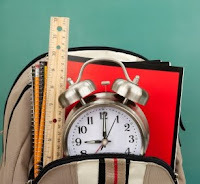 If the impact on test scores is not significant then we might just be creating students that are only capable of counting down the extra minutes until the school bell rings.